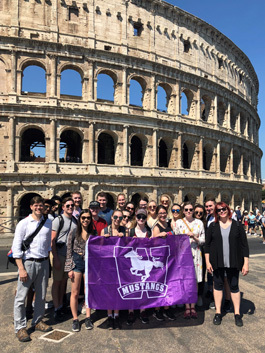 The CS3050G: Study Tour to Italy participants have arrived in Rome! Feeling travel envy? For more information about our Study Abroad opportunities, visit our Study Abroad page! The Department of Classical Studies is proud to report that Michelle Sugar, one of our PhD students, successfully defended her dissertation on April 13th, 2018. Michelle's dissertation, supervised by Professor Randall Pogorzelski, is entitled "Guilt in Vergil's 'Aeneid' and Lucan's 'Bellum Civile'". Congratulations, Dr. Sugar! Debra Nousek has published three essays as part of The Landmark Julius Caesar project. Spanning some 800 pages in print, and a further 300+ pages of freely available online material, The Landmark Julius Caesar is the definitive edition of the five works that chronicle the military campaigns of Julius Caesar. Together, these five narratives present a comprehensive picture of military and political developments leading to the collapse of the Roman republic and the advent of the Roman Empire. Debra’s contributions cover Caesar’s reputation as a literary author, his legacy as a classroom text, and the literary features of The Gallic War in particular. The full range of Web Essays can be found via the above link. 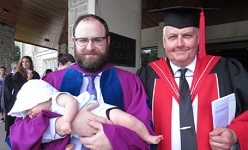 Tim Wright received his PhD at Spring Convocation. Dr. Wright defended his dissertation, supervised by Prof. Christopher Brown, in December and has accepted a position at Queen's University. Congratulations to our recent MA grads, Cody Andersson, Edin Gurdic, Morgan Kostiew, and Meagan Robinson! 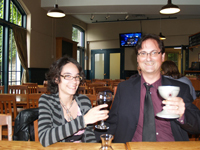 The Classical Studies Department congratulates Morgan Kostiew on successfully defending her MA thesis, "Xenia in Classical Economies: The Function of Ritualized Interpersonal Relationships in Athenian Trade", supervised by Bernd Steinbock. Congratulations to Beth Greene and Alex Meyer for their successful SSHRC Connection Grant! 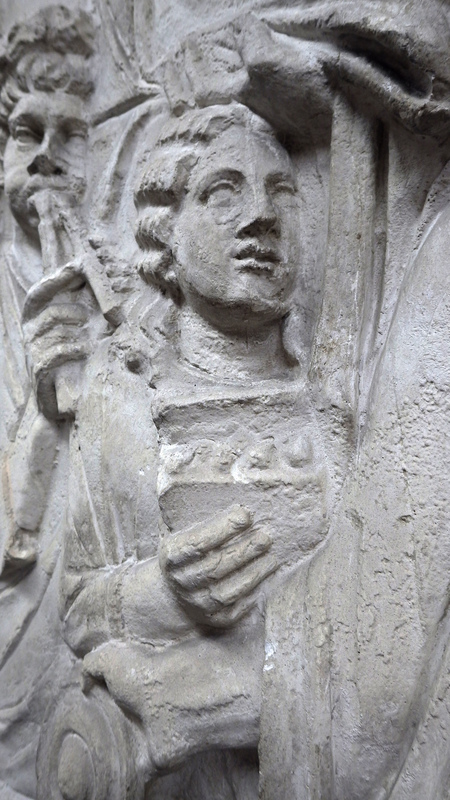 This grant will bring together a group of international scholars for a two-day symposium called "Unlocking the Provinces: Defining and Prioritizing Roman Provincial Studies." The conference is a collaboration between researchers across Canada, the US, UK and Europe to share varied perspectives and approaches to Roman provincial research. The symposium addresses the need for a globalized and cross-disciplinary dialogue on the subject, informed by the fast-paced changes and shifting perspectives in scholarship and research around the world today. Dr. Kelly Olson discusses the bedrooms of the Romans on Newstalk 1290 CJBK. Read more here. Congratulations to Rob Woodcock on sucessfully defending his MA thesis, "Identity and Language Contact in Roman Britain", supervised by Alexander Meyer. The Department of Classical Studies is pleased to announce that Benjamin Moore, 3rd year Honors Specialization student in Classical Studies, has been awarded the Harry C. Maynard Scholarship for Study Abroad for his essay titled "Of Laws of Kings". Benjamin will be using this award towards his summer excavation plans at the Vindolanda Field School. Congratulations Benjamin! Congratulations to Dr. Peter Miller, who graduated from our PhD programme in 2014, on being appointed to a tenure-stream position in the Department of Classics, University of Winnipeg. Kelly Olson has recently returned from a trip to the ancient city of Pompeii, where she was interviewed about Roman sexuality and the brothel for a documentary entitled "Raising Pompeii," a co-production of iTV (Britain) and CBC. The host for the British version of the show was UK's Michael Buerk, and the host for the Canadian version was none other than David Suzuki! Kelly had a wonderful time filming with cast and crew, and enjoyed taking David Suzuki around the Pompeiian brothel. Look for the show to air this winter on CBC. Interested in archaeological excavation? Thinking about spending a summer abroad? Click Here to learn more about the Vindolanda Field School in England offered through the Department of Classical Studies at Western. Dr. Catherine Pratt was a part of the UC archaeological team in Pylos that discovered a rare warrior tomb filled with bronze age wealth and weapons. Dr. Aara Suksi is the CAC/ACA Atlantic Tour Speaker this Fall. She will travel From September 23 - October 3rd to 7 Universities in the Atlantic provinces: St. Mary’s University, Dalhousie, University of New Brunswick, Mt. Allison, Acadia, Memorial University of Newfoundland (both the Grenfell and St Johns campuses). 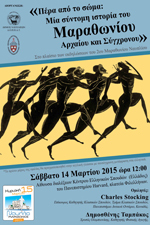 The lectures will be on topics in Greek literature from Homer to Aeschylus. The Department of Classical Studies is proud to report that Dwayne Meisner, one of our PhD students, successfully defended his dissertation on August 25, 2015. Dwayne came to us from the MA program at the University of Regina and has had a stellar career during his time at Western, with his research excellence having been recognized by both SSHRC and OGS. Dwayne’s dissertation, directed by Professor Christopher Brown, is entitled "Zeus the Head, Zeus the Middle”: Studies in the History and Interpretation of the Orphic Theogonies". Congratulations, Dr. Meisner! Tim Wright, Catherine Pratt, Charles Stocking, and Janice Forsythe (Kinesiology, ICOS), and Guy Schultz (UWO Cross Country. Track and Field, not pictured) all participated in the fourth annual symposium, “Sport, Society, and Culture” in Olympia, Greece, July 5th-July 9th 2015, sponsored by the International Olympic Academy and the Harvard Center for Hellenic Studies. The symposium brought together over 80 professors and students from around the world in order to focus on the history of the ancient Olympics and the challenges posed by the reception of the ancient Olympics in the modern world. Congratulations to Jonathan Vickers, who has been awarded the prestigious Crake Fellowship for 2015-2016 at Mount Allison University in Sackville, NB. The Classical Studies department congratulates Sarah Taylor on sucessfully defending her MA thesis, "Frontiers of Food: Identity and Food Preparation in Roman Britain", supervised by Elizabeth Greene. Congratulations to Kyle Gervais from the Department of Classical Studies on the publication of Brill’s Companion to Statius, the first companion volume to be produced on the most important Roman poet of the Flavian period. Thirty-four chapters from international experts examine the social, cultural, and political issues surrounding Statius’ poetry; his controversial aesthetic; his use of the poetic tradition; and his scholarly and literary reception in subsequent ages to the present. The Department of Classical Studies would like to congratulate Elizabeth Greene, winner of the 2014-2015 Marilyn Robinson Award for Teaching Excellence. The award is "...named after Physiology professor and Educational Development Office coordinator Marilyn Robinson, who became captivated with the idea of exciting students by means of active learning and problem solving" (Western News). Elizabeth Greene teaches Archaeology to Western University students not only in the classroom, but also through the Vindolanda Field School, a historic Roman site near Hadrian's Wall in England. Read the Western News article here. Charles Stocking, Assistant Professor of Classical Studies at the UWO and a former Fellow of the Center for Hellenic Studies, delivers a lecture withDemosthenes Tampakos, Olympic gold medalist and Professor of Physical Education, on the occasion of the 2nd Marathon Run at Nafplion. View the poster and translation from Greek, here. Chris Brown recently gave the 38th annual Crake Lectures at Mount Allison University in Sackville, NB. The lectures explored the confluence of poetry, philosophy, and religion in Magna Graecia during the fifth century BC. Beth Greene’s research at this year’s annual meeting of the Archaeological Institute of America in New Orleans has been featured in a variety of news outlets. The magazine New Scientist ran a story about her research focusing on the presence of women and children on Trajan’s Column in Rome. The individuals are shown taking part in religious ceremonies associated with the campaigns of the emperor Trajan in Dacia and reveals something about the activities of women traveling with the Roman army on campaign. Her research has since been featured by Radio Canada International (http://www.rcinet.ca/en/tag/elizabeth-greene/) and by our own Western News (http://news.westernu.ca/2015/02/women-present-no-second-fiddle-in-roman-military/). It will be in print form in Current World Archaeology Magazine later in 2015. Sarah is the winner of the 2014 Bea Loveseth Memorial Award. The award is presented in recogition of the best student paper presented at the Chacmool 2014 Conference, at the University of Calgary.